No, this is not a completely open-ended question….but I would love it if you could help me out! But first, let me backtrack. See that lovely oversized beach tote? It’s sitting on the diving board of my brother-in-law’s pool! I met SisBoom on Twitter. She is the incredible designer Jennifer Paganelli. Wander through her web site and be prepared to be amazed at the array of colors and patterns as well as her new book, “Girl’s World.” This fabric is one of her laminates. 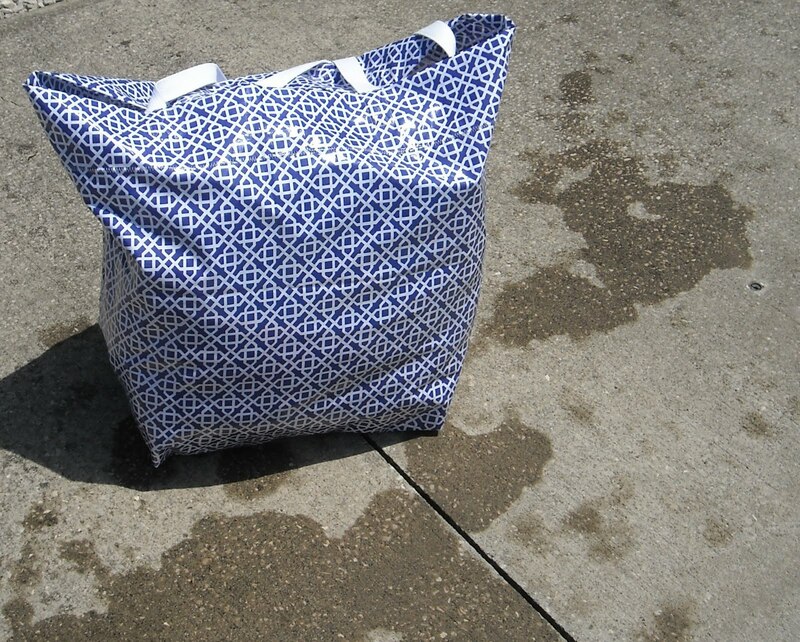 I decided to whip up an oversized beach tote for myself out of this fabric. I have used the same bag for more than 10 years or so and thought I could use a second one. I figured that the laminate would be good for a bag that is in the “splash zone” at the pool! 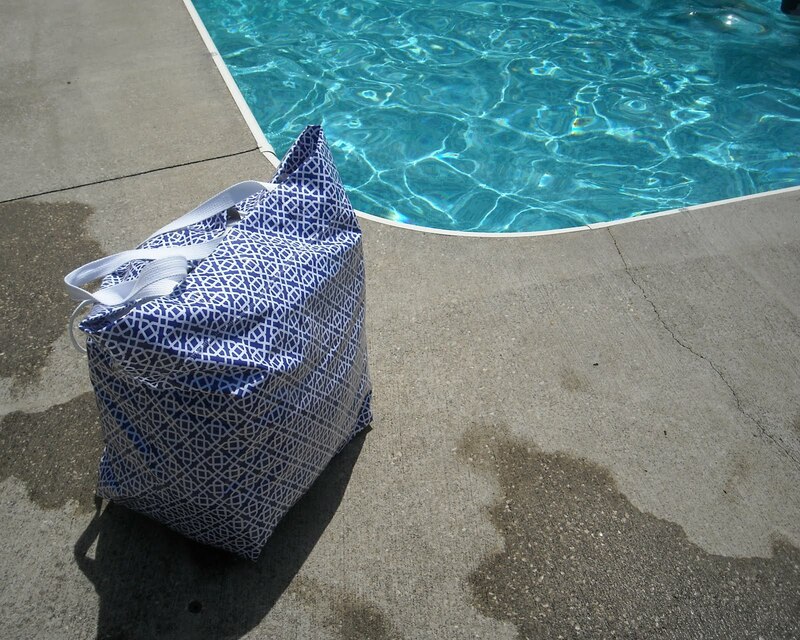 Do you ever go to the pool, throw down your bag and end up with damp towels? The laminate is the perfect fabric to keep the moisture out! At the end of the day, I simply threw all the wet towels and bathing suits back into the bag and tossed it in the trunk to go home. So I am thinking that this would make a nice beach bag. Which, in turn, made me think about what is the IDEAL beach bag? What would your ideal beach bag be? I have had wonderful customer response to my bags. You’ve got to see this post by “rock star” Twillypop. In response to customer desires, I am adding features like pockets and key clips. But in looking forward, help me by describing what your ideal beach bag would be like. I’ll list some ideas to get you started, but feel free to chime in with anything! – Sturdiness: Land’s End makes bags of heavy-gauge canvas. These can stand up on their own. – Lightweight/portable: My current bags are not heavy (until you put 10 towels in) and they can be folded for ease of travel. – Handles: cotton webbing or fabric to match? I love the idea of the laminate fabric! And what gorgeous patterns too. I have two “big things” that I need for my bag tote. One is pockets, one for my cell phone, another for sunscreen, etc. but my biggest concerns are keeping sand out of the pocket where I stash my phone, and making sure if my bottle of sunscreen decides to explode, it doesn’t get all over the rest of my stuff, including the phone! The other problem I always encounter are uncomfortable straps. I like to loop my bags over my shoulders so my hands are free for other things, but especially after a long day at the beach, my skin and shoulders are tender and with the straps digging in, ouch! I don’t know what you could do to counteract that, but it’s just my two cents of what I always thought about beach bags. I keep retweeting and never comment, sorry. I love the size of your bags. Perfect. I also love the outside pocket for reading material and inside pockets for phone and lotions. I like a sunbrella type material, but I think the laminate is even better. Waterproof is Wonderful. I especially would like to keep our blanket and towels dry. As for colors, I’m an earthy girl and would love olive greens and tans and maybe in a tropical or animal print. 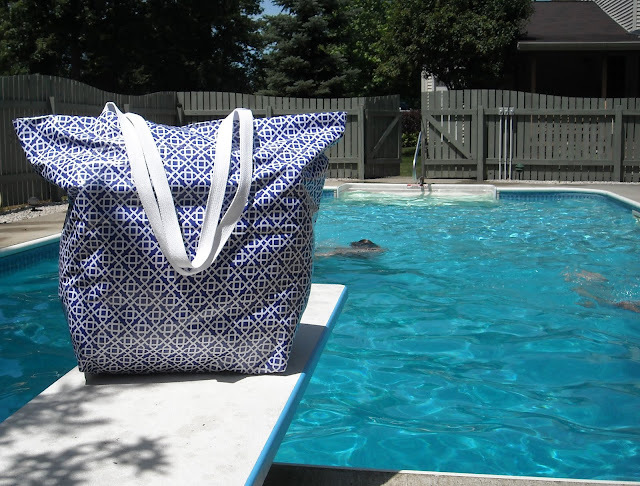 The laminate fabric is so pretty– I love blue and white, especially for a summer bag. One thing that is important to me is that the bag hold up well in the wash. I tend to be spilly. I love that pattern, glad to see your still making them!! pockets are # 1 for me–of all sizes. maybe even a secret pocket for ‘valuables’ that one might need to take along. waterproof is genius! i think maybe a pocket in the front would be good too. I live minutes from the beach, and we’re there nearly every (if not every) day of the summer. Laminate fabrics are AWFUL for the beach, and I’ve gotten rid of every one I’ve ever owned because the sand just sticks and clings to everything like crazy. It gets into the nooks and crannies making it hard to keep clean. In theory, laminate (oilcloth) should be perfect, but the reality is that it just doesn’t work. Pockets are important, and I like a few outside ones for my cellphone, car keys and lotion. The outide lotion one is really important because you need to grab it quickly to cover your kids when they least expect it (ha ha) and also just in case the sunscreen bottle/sprayer leaks (as mine have been known to do). LL Bean used to make a great one, but it’s not on their site anymore. It was canvas (washable, hurrah) and had six outside pockets (one for the sunscreen, another for phone, another for keys, another for water bottle, etc.). This one is similar, but imagine outside pockets halfway around the entire bottom. http://www.llbean.com/llb/shop/37037?feat=38534-ppxs&dds=y My sister, mother and I all use my version this bag (different colors) and nearly all of our beach friends got their own, too, because it was so practical and easy to clean. A key fob or hook would be great, you could clip on your keys and know right where they are. Wet bags aren’t important to me — my kids shower off, then wrap themselves in their towels (over their suits) and ride home. The bag always doesn’t have to be too huge, usually I carry 4-5 towels at a time and so I just ‘hang’ them over the opening. A zippered closure at the top is a must — sand gets in as well as hungry seagulls sometimes looking for a snack. And long shoulder straps so you can tote the bag as well as your chair(s), umbrella(s) and toys. Okay, Lands End has a better image that shows what kind of pockets I’m referring to. Each panel has a pocket on the outside, all along the bottom half of the bag, and the four corner pockets are actually darted so as to be more full and allow for a larger sized item to be placed inside.